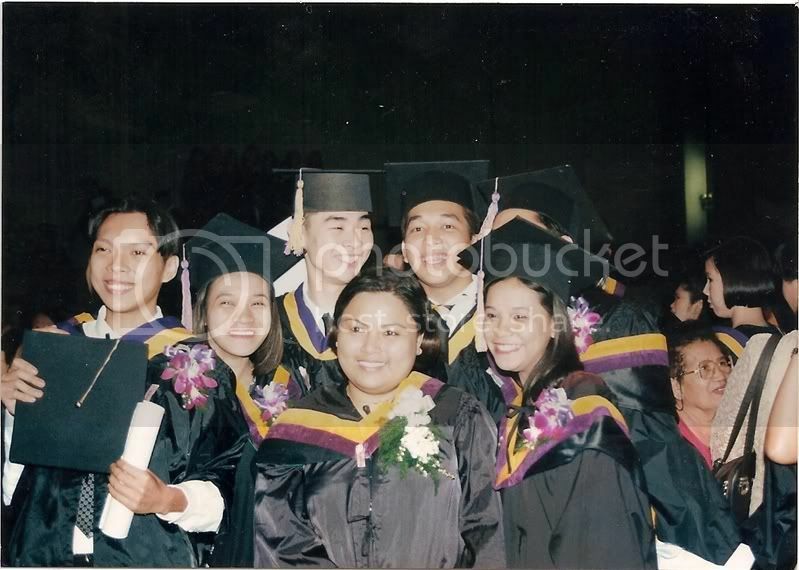 Here's my share for Memory Lane Monday's last theme for this month - College Graduation. Yesterday, I saw a music video that a classmate from college shared in Facebook. 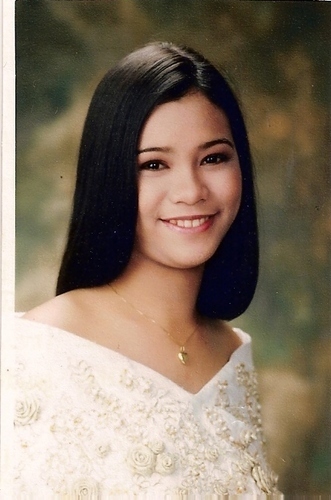 It's apparently a baccalaureate mass video entitled, "Bakit mo mahal ang UST?" ("Why do you love UST? "), made by a group of students. I get a wee bit sentimental watching it because it just brings me back so much memories of my fun College days, particularly of my barkadas, classmates and close friends. 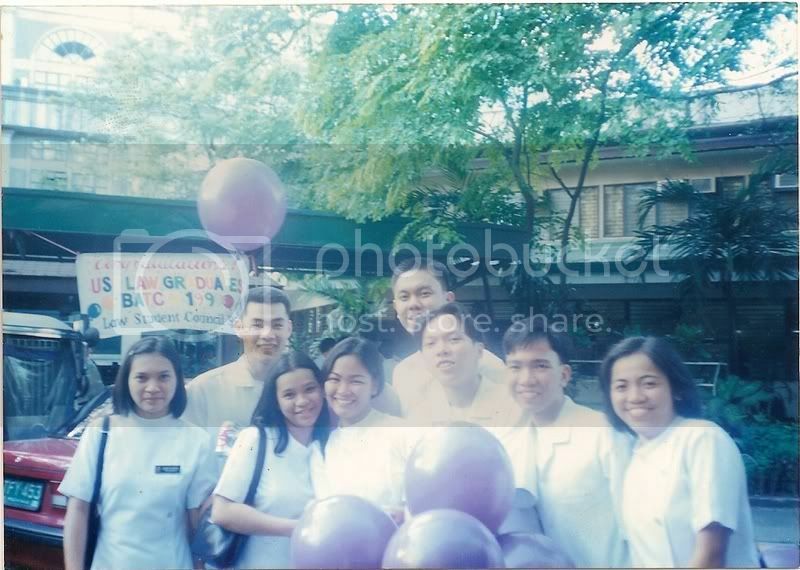 I started college at quite a young age (15), so I could say that I did spend a good deal of my teenage years in UST. My favorite lines in the song are, "...dito tayo umibig, dito tayo umiyak, at sama-samang nagsaya..." (here was where we loved, cried and rejoiced together) - which are all true to me - I didn't only learn academics in UST but I also discovered some of the most wonderful things in life like friendship, camaraderie, companionship, youth, and basically, growing up. This was held the night before our graduation day. 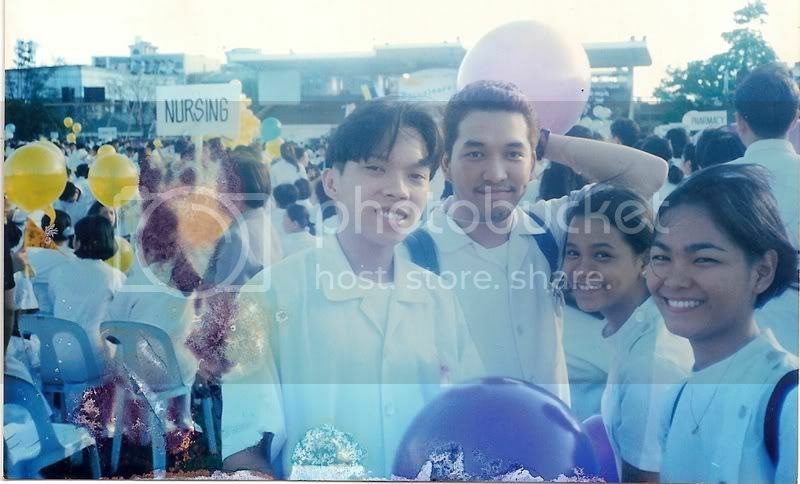 I think I was post 16 or 24-hour duty that day but I didn't want to miss the baccalaureate ceremony, so I attended despite the lack of sleep. The south borders of the barkada - Kuya, Arts, Baby G, and Momsie. I miss you, guys! 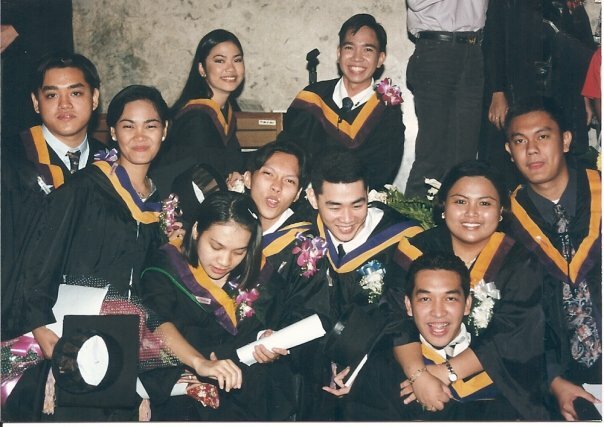 Chillaxing in the main building second floor after the baccalaureate ceremony with some of my kabarkadas. 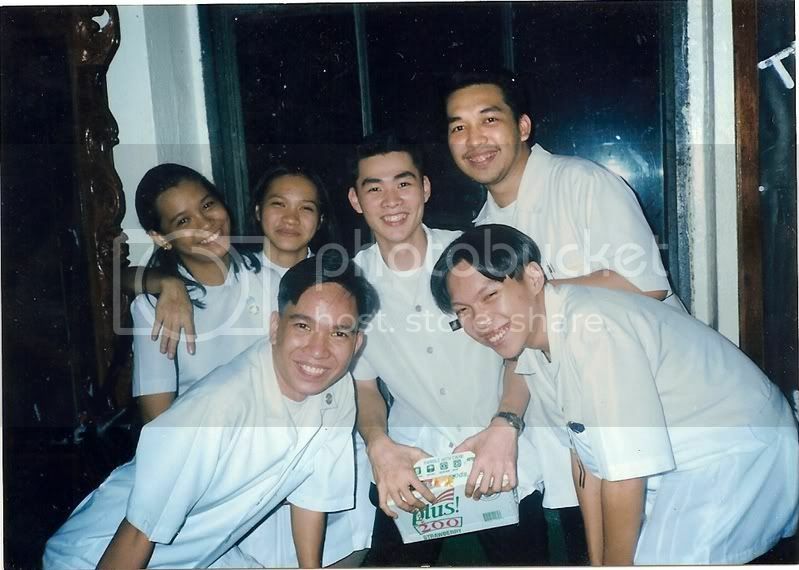 I sort of have a big barkada, and pictured here are Sam, me, Weng, Chipp, Artie and JP. I should've worn a smudge-proof, waterproof mascara. 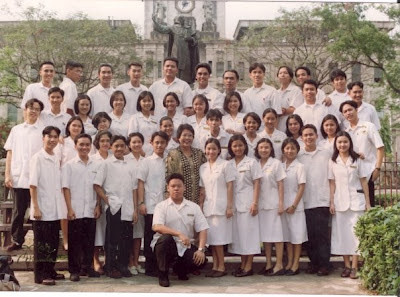 My third year class picture - last academic year before we embarked on internship. Honestly, I was kinda disappointed at myself for not being able to achieve the look I wanted for my cake. First, I yet again had another tough time icing my cake. Although I've noticed that my icing technique had relatively improved as compared to when I iced my first cake, I really wish I could have done it much better. 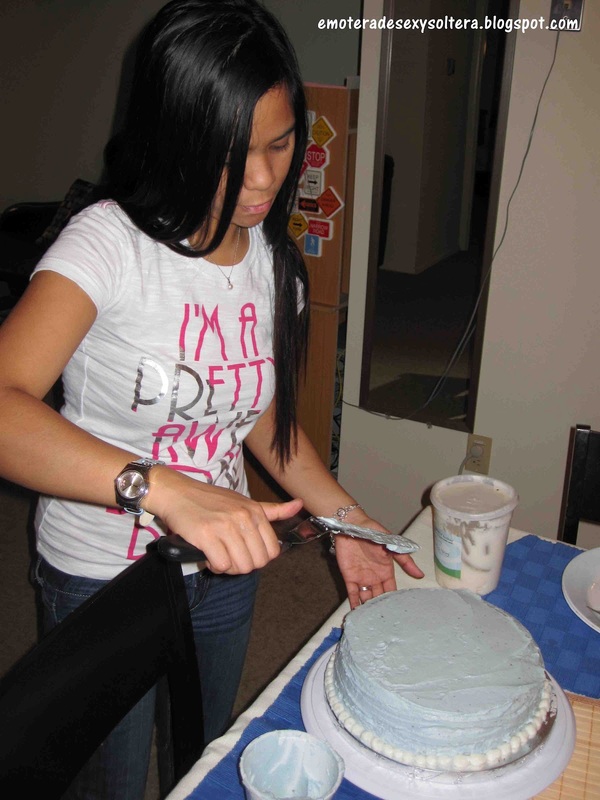 There were a lot of rough and unevenly iced parts on the side of the cake. The icing was supposed to be white and smooth, but because it was a red velvet cake underneath, the icing turned pinkish and those red speckles all over were cake crumbs that my spatula kept on catching as I was icing it :( Boo! I really need to practice more and work on my icing technique, but I'm going to try my luck next time with a cake icer tip, and hopefully, that will save me time and effort, resolve my icing technique issues, and make it much easier for me. Secondly, the flowers on my final cake were "soggy." When I baked and decorated cupcakes with swirls and flowers last week, I was really pleased with my finished product. For my final cake though, I had to transport the made-ahead flowers in a plastic container, and by the time I got to my class, the flowers already softened up and some had been crushed during the travel. However, I'm pretty comfortable with piping basic borders and flower designs, so I'm positive that had I decorated my cake at home, I would've made a better job in that regard. 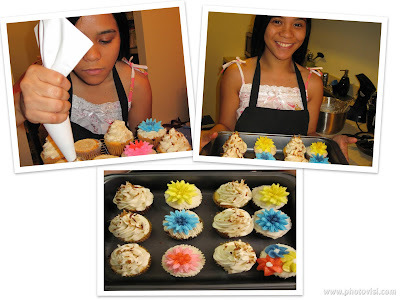 I dressed up my cupcakes for a spring party! 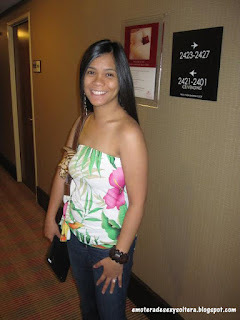 A tube top is a piece of clothing that is shoulderless and sleeveless and wraps around the upper body/torso. Generally, tube tops are very tight over the chest/breast area, so as to prevent and avoid these garments from falling down. This is usually achieved by using elastic material for the whole garment, or by simply putting a garter on top and/or bottom, and/or around the chest/breast area of the garment. I read from Wikipedia that the first tube top was actually a "mistake," however, samples of the product were being distributed already. 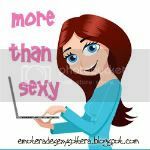 Surprisingly, the tube top received positive reactions from the market, which placed them on shelves worldwide within a month or two. It reached its peak in popularity in late '70s, and disappeared from the fashion scene in early to mid '90s. It regained the limelight in 2000's, and with various versions of the style coming out, it has been "in" since then. 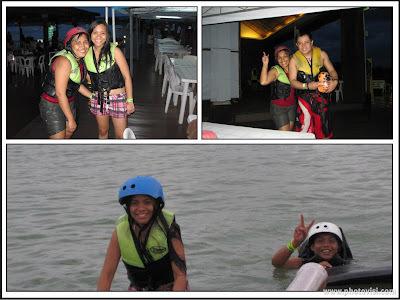 During my family's Bicol vacation last November, we went to Camsur Watersports Complex (CWC) for a little aquatic sports activity. 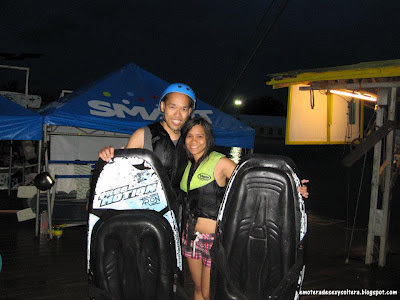 Vince had previously done knee/wakeboarding at CWC several years back, and he got me so hyped up when he told me how fun his experience was, so I made sure that I included this in our very cramped itinerary. We got to CWC quite late in the afternoon and because it was starting to get dark already, not to mention it was raining and Pakoy was sick, unfortunately, we weren't able to explore the whole complex. 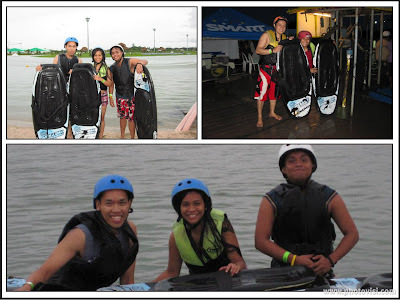 Despite that, my sibs and I had a great first time experience of kneeboarding. So, how does one kneeboard? Basically, you position yourself on the kneeboard by kneeling (hehe!) and you hold onto a tow rope which is attached to a machine that pulls you around in fast speed. In CWC, there are markers that you have to sort of stay within, especially during curves and turns, to keep yourself from falling into the water, as well as to avoid being pulled back by the machine. Trust me, you don't want that crazy machine jolting you! Oh my jeez, I felt like my shoulders were going to detach from my torso every time I got strongly pulled by that machine. Ugh! On my first try, I was screaming on top of my lungs like a birthing mom, everyone in CWC at that time probably thought I was crazy. Haha! Vince, me, and my younger brother, Pipoy, were all successful during our first round of kneeboarding. We were able to make a full circle without falling into the water, and most importantly, with our upper bodies intact in one piece. LOL. My sister didn't want to try it at first, but when she heard us laughing and exchanging our funny stories after our first round, she quickly changed her mind and joined the fun. My bro-in-law fell while maneuvering a turn on his first round, so his wife (my sister) was teasing him that he had gone shopping somewhere, because it took him so long to get back to the starting point. He sort of lost his board in the water and he was on the far side of the waters when he fell, so it took him a while to walk back. But guess who fell in the water next? Nonetheless than my sister and my bro-in-law got his turn to tease her. Haha! My bro-in-law wondered, "Where was I when this picture was taken?" He had the right to ask that because there were supposedly four of us kneeboarding then. My sister blurted out, "That was when you fell in the water!" All of us cracked up laughing. Haha! TRIED EXPAND 'N GRO WITH MIRACLE-GRO YET? Spring is here, and it's yet again the time to get plants growing. I never considered myself as one with a green thumb but seeing my neighbor's garden in bloom somewhat makes me want to give gardening a shot. I thought that it's probably a good idea if I start growing flowers in pots, and in my quest to know about the ultra basics of gardening, I came across Expand ‘n Gro™ with Miracle-Gro Concentrated Planting Mix. Last Monday, I learned from Wilton Basic Cake Decorating Course how to pipe shaggy mums, pompom flowers, drop flowers, rosettes, leaves as well as how to put filling into cupcakes and decorate them. For that lesson, I baked Black Bottom Cupcakes to practice decorating with while in class. Since I needed plain uniced cupcakes at the time, I didn't add the usual cream cheese filling that goes into Black Bottom Cupcakes. Honestly, I was successful in baking those cupcakes and I really liked it, but I'll hold off on sharing the recipe and pictures here in my blog until the next time I make them with both components present - cake and cream cheese filling. 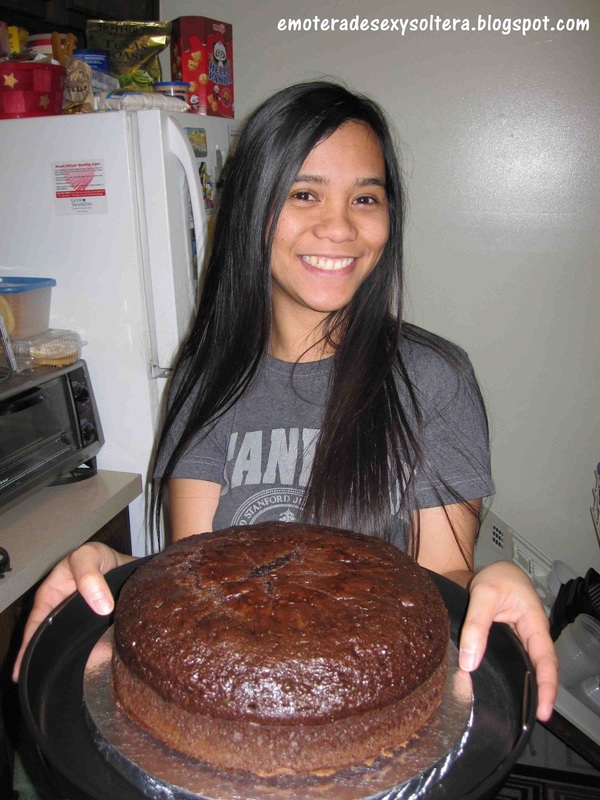 Anyway, I was invited for a dinner tonight at one of Vince's co-residents' house, and I took that chance to hone my baking and decorating skills (or the lack of it!) by obviously showcasing my latest hobby. Since I wanted to step up my game and go beyond the common chocolate or vanilla cupcakes, I spent several nights reading up on various recipes. I didn't want to be too ambitious because I don't have much baking experience myself, plus some ingredients for elaborate and level-up recipes are not easily available at the grocery store, so I went for something that I'm familiar with - COCONUT AND BANANAS! All dressed up and ready for a spring party! I got this idea from a Better Homes and Gardens Special Interest Publication - Cupcakes magazine. The Island Bananas Foster recipe listed in the magazine is a bit complicated for me (I think). It's a "spiked" cupcake in that rum is one of the ingredients for the batter, and for the frosting, you have to ignite the rum and set your pan on flame - you know, just how you see chefs do it on TV - that stuff, and I'm definitely not on that level yet, so with fingers crossed, I decided to modify the recipe - batter and frosting. I was wary not to screw up because I was doing modifications to a "live" cupcake. Should they turn out inedibly bad, I cannot just toss them to the garbage or else I will have nothing to bring for dinner, so this recipe that I had concocted in my mind has got to be right. 1. Pork chop with nutty fruit stuffing - After I marinated thick cut pork chops with Sprite, soy sauce, and some taco sauce overnight, Vince cut into the chops to make pockets for stuffing. He cooked a pack of chicken stuffing as per package instruction, and then filled the pockets with cooked stuffing, chopped almonds, pecans and walnuts, and apple slices. 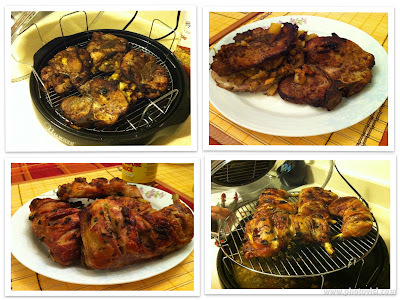 He brushed some olive oil onto the chops, and then grilled it for about 30 to 45 minutes until done to our liking. Served with my favorite UFC Tamis Anghang (sweet and sour) Ketchup, these chops were absolute home run for us! 2. Barbecued chicken with cilantro - Vince marinated Chicken quarters with olive oil, cilantro and garlic overnight. He then barbecued them for about 30 to 45 minutes. Served with Mang Tomas All Around Sarsa (sauce), we devoured these chicken barbecues with our bare hands, no cutlery required. Rap-sa! Have you ever ran a race? I haven't. I know quite a few people who are into marathons and even triathlons, but I have yet to personally know someone who joined and succeeded a Spartan Race. The main goal for marathon is to run towards the finish line, whereas in triathlon, one needs to swim, cycle and run to the finish line. However, to emerge as a Spartan, one needs to run, jump, climb, crawl, dive, slide, dodge, carry, drag, throw and be on your feet without knowing what you're going to get next! Created by eight ultra endurance athletes and a marine, Spartan Race is a world class obstacle race that requires participants to be totally athletic, disciplined and mentally tough. One can choose to traverse and battle the unknown miles alone or by group with friends or even family members with one objective in mind and that is to reach the finish line as a Spartan warrior(s). The Ultimate Spartan Challenge is a three-part race. The first part in this challenge is the Spartan Sprint. If you think this is just another mud race, you have to rethink that. There may be fire, wires, and a whole bunch of what-nots that come with this sprint. Next is the Olympic Super Spartan which involves 8 miles and a dozen plus obstacles which will make you push yourself harder to catapult your way to the finish line. If the first two races did not faze you, step up to the Ultra Spartan Beast Challenge. With another 12 miles of obstacles, this race will show your strength, weaknesses and commitment to finish what you have started. Conquer all those three challenges and you will become an Ultimate Spartan. For Spartans who are up for more difficult obstacles, there is the Spartan Death Race which is an ultimate test of physical, mental and emotional endurance. This is definitely not for the weak or faint of heart! Also, the element of surprise is constantly present in every Spartan Race. You will never be provided a course map, so if you need one each step of the way, then maybe the race is not for you. One of my "extracurricular activities" that has taken up some of my blogging time recently is Wilton Basic Cake Decorating Class. I signed up for this eight-hour course at Michaels Arts and Crafts Store, and I have attended two of the four lessons so far. It has been keeping my weeknights busy because I'm not a crafty person and so I have to devote some time after work to practice piping, read the book, research for recipes, etc. 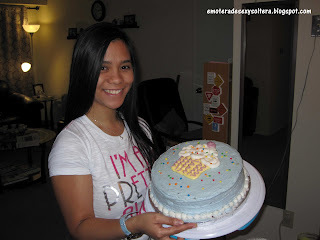 Anyway, during the first lesson, we were taught the basics of baking a cake, how to prepare icing with different consistencies, how to level, torte and ice a cake, and how to make a design pattern and transfer it onto a cake. At the end of the two-hour class, we were given time to practice piping stars onto flat round cookies using Wilton star tip and ready-to-use decorator icing. We were also given a homework to bake a cake and prepare medium and thin consistency icing, which we then brought to class on the second lesson for application of what we had learned the previous week. 1. Bake a cake at home. Check! Want some chocolate fudge cake? 2. 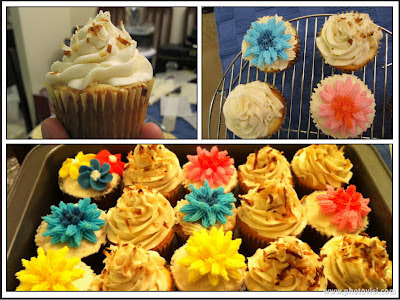 Prepare thin and medium consistency buttercream icing at home. Check???! Conquering Wilton's almond buttercream icing recipe. 3. 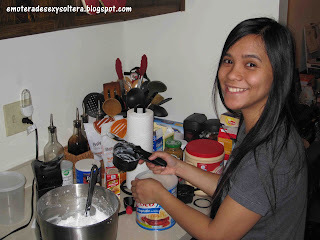 Leveling, torting and icing the cake. Uh-oh! Mayday, mayday! This part was done inside the classroom, so unfortunately (or fortunately I should say), nobody took pictures to document my disaster while I was icing the cake. It seemed that the icing I prepared at home was not the perfect consistency and so I had to redilute it with water to make it thinner. I spent a lot of time tediously icing my cake and trying to smoothen it as much as I could, which in turned caused me to run out of time to finish decorating it on class. My teacher wanted to see my decoration, so I told her that I'd continue at home and will show her next week a picture of my finished product. My T-shirt says: "I'm a pretty awesome Pinay"
4. Dimensional decorating. 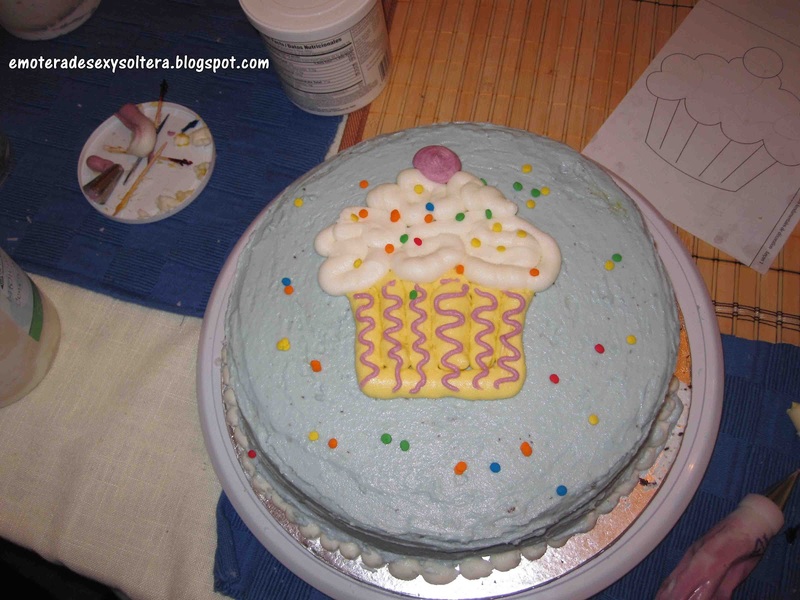 This also involved coloring the icing as desired, and transferring the design pattern onto my cake. I toiled on the icing redo job and I was too tired and hungry already by the time I finished icing my cake that I decided to skip the design transfer portion and just piped and decorated directly onto my cake. My anything goes dimensional decorating. I swear a gradeschooler can do better than me on this! 5. Tadaaaaa! Oh well, this may be the ugliest cake in town, but hey, it's my first time and I did put my best effort on this, so I'm happy and proud of it. Yay! 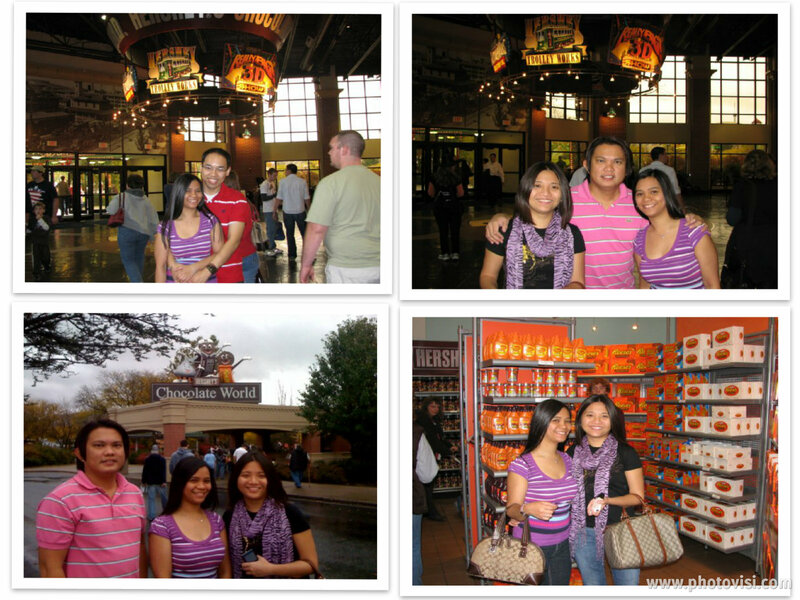 Vince and I live about 30 minutes away from Hershey, Pennsylvania, aka Chocolatetown, USA/The Sweetest Place on Earth. The headquarters of The Hershey Company are located in Hershey, PA. As well, it serves as home to Hershey's Chocolate World. 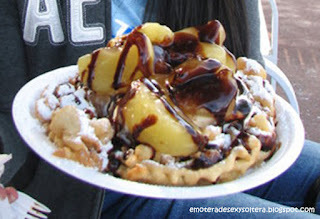 Funnel cake is a regional food in North America and popularly sold at theme parks, carnivals, fairs, sporting events and beach side concession stands. It is basically cooked (deep fried) by pouring batter into hot cooking oil in a circular motion (a funnel-like cooking instrument is used at times) until the batter turns golden brown. Powdered sugar, powdered cinammon, chocolate/strawberry syrup, nuts and sliced fruits can be used as toppings and sprinkles for funnel cakes. 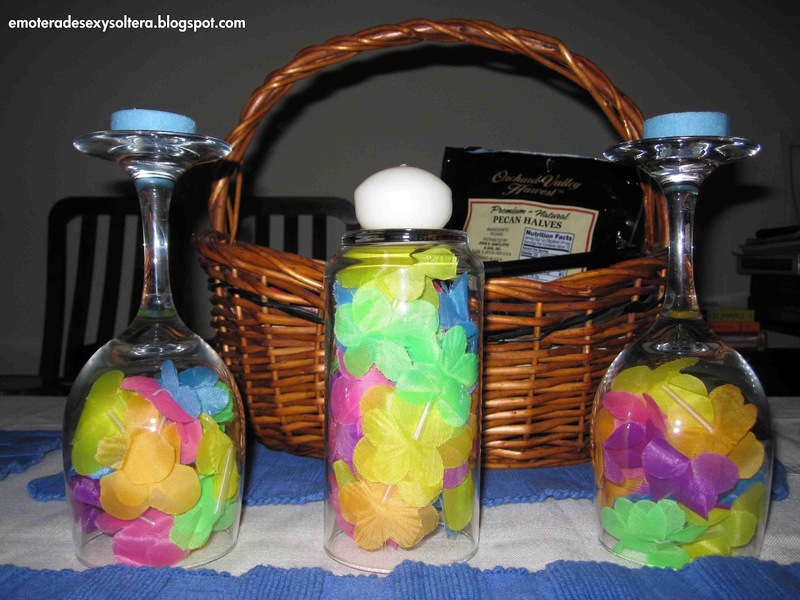 While blogwalking this morning, I came across this nice and easy do-it-yourself project. The original article featured a Christmas-themed candle holder centerpiece with three upside down glass wines, each with a mistletoe inside and red tea candle on top. I thought our dinner table at home was a little bare and could use a bit of dressing up and this DIY would make a really pretty centerpiece, so it got me excited to take on this DIY. I eagerly scouted our home for the materials needed. 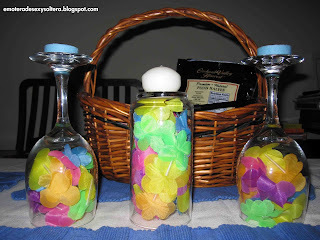 I was lucky enough to have found two unused glass wines that Vince and I got as a gift (we are not wine drinkers, so we don't really use them), a couple of fake lei (which were used for my Hawaiian-themed birthday party last year) sitting in a basket just collecting dusts, and about half-a-dozen of tea candles. Since the original idea called for a three-candle holder centerpiece set and I only have two, I just used an ordinary glass as my third man in this triumvirate of a craft. One place I would love to visit again is Orlando, Florida. I went there in spring of 2009, and although my vacation was dedicated primarily for Disney World, I thought I'd be able to see other theme parks and attractions, which unfortunately I didn't get to do. 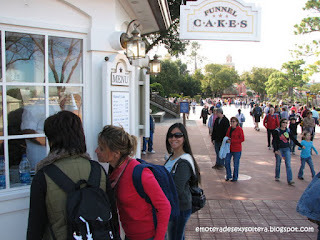 With a lot of things to do and places to see in Disney, let alone Orlando, my five-day vacation was just not enough! I went there during at what I thought to be an off-peak season, but I was surprised at the amount of tourists that flocked to this vacation destination. Aside from my fun Disney adventures, luckily I was able to squeeze in a little bit of shopping at an outlet mall strategically located close to the hotel where I stayed at, as well as dining in some of the good restaurants in the area. I definitely don't mind going to Orlando again and having a second take of this famous vacation spot. Being part of the sunshine state, one good thing about Orlando is that regardless of the season, there are so many Orlando events happening throughout the year. There are a lot of featured annual events, many of which take place at famous attractions such as Walt Disney World Resort, Universal Orlando Resort and Seaworld. If you go to Orlandoescape.com, you will find a year-round calendar of activities including beautiful parades, colorful art shows, fun sporting events and wonderful holiday celebrations. The website also makes finding good Orlando hotels and deals easy, and if you want to save more money on your Orlando vacation, you can choose from its list of various vacation packages which include hotel accommodations, theme park tickets, transfers and a lot more additional perks. 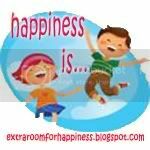 So, if you're considering of a grand Orlando vacation, go ahead check out Orlandoescape.com for yourself, and make the most out of it. Black River is the longest navigable river in Jamaica. Its name refers to the darkness of the river bed caused by thick layers of decomposing vegetation or peat. 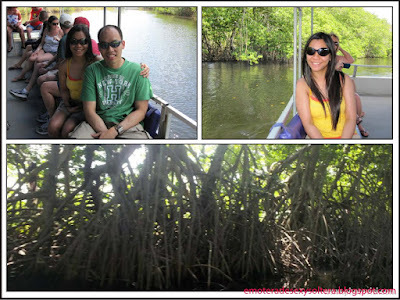 Black River has a rich ecological environment primarily composed of mangroves with long areal roots that serves as habitat to over 100 species of bird, fish and other freshwater creatures, as well as American crocodiles. I learned in this tour that due to the large amount of methane the peat gives off, Black River experiences a lot of spontaneous combustion wherein some parts of the river would regularly just burst into fire spontaneously. In fact, when we were doing the tour, we saw a big smoke coming from a far off spot, and our tour guide said that was spontaneous combustion in action. 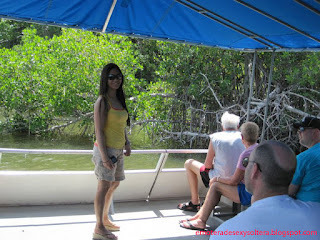 Now, the fun part of this tour was when we got to meet and greet the numerous resident crocs of Black River. 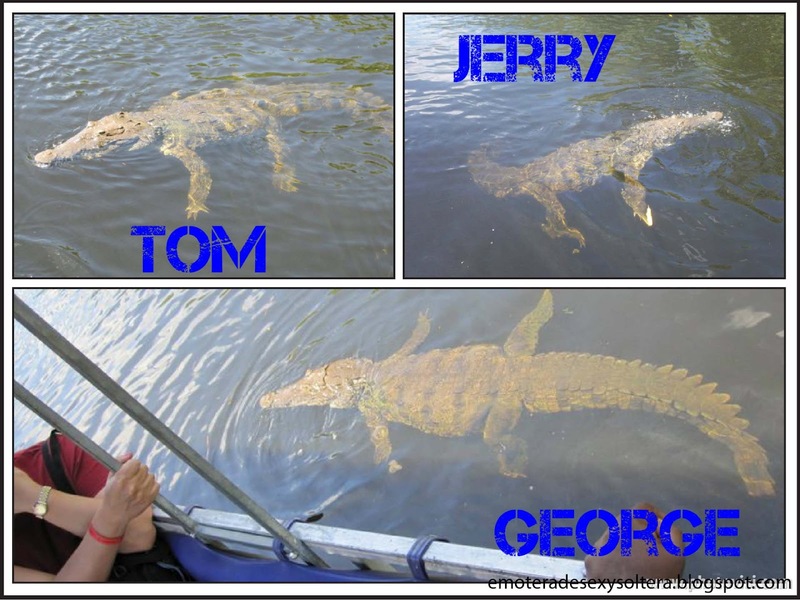 These large aquatic reptiles are like pets to the locals particularly the tour guides. The crocs have names and are well taken care of, I could tell. While on tour, the guides would call out their names, and would feed them with raw chicken meat once they appear in the water. So that kind of explains why the crocs are not too shy in showing themselves and approaching tour boats because they actually get good treats! George is a pretty big and fat crocodile. He was the first of the many to say "hi" and wag its spiky tail to us. He was friendly. It didn't take a lot of coaxing from our tour guides for him to come near us. We then got to a spot where there are more than one resident crocodiles. 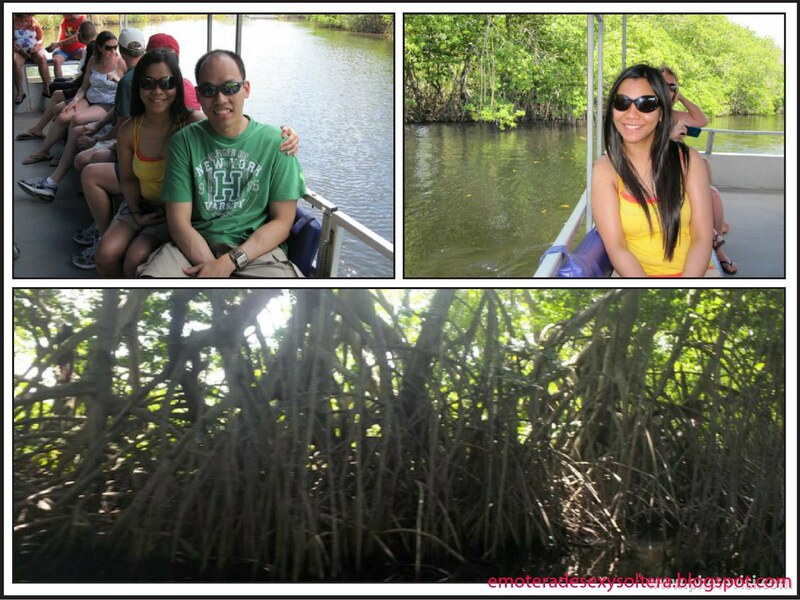 According to our tour guides, that's kind of unusual since crocodiles are territorial animals. There, we met Tom and Jerry. Apparently, they always fight and chase each other, hence they were branded with those names. I was amazed because our tour guides were able to differentiate Tom from Jerry as how your would be able to with your own dogs! Jerry, I think, is the smaller and thinner of the two. At one point, our tour guides yelled out different names but there was no sight of a croc nor a single scaly snout poked out of the water. Our smart tour guide then quipped, "If nobody's home, you can jump on the water for a swim." LOL. He then added, "I would love to volunteer myself but these crocs like imported meat - white meat. They will just ignore me." Haha! Before you think of that as a good but silly joke, guess what? One of the reviews I read about this tour is that there's one group who actually went into the water for a swim. The tour guide apparently initiated jumping into the water and then about half of the tour group followed. They even have pictures while they were in the water! Isn't that nuts? Swim in a river full of crocodiles? Crazy! 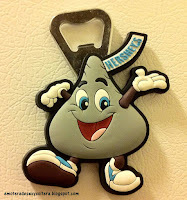 In Hershey, Pennsylvania, there is a restaurant called "What If... of Hershey." 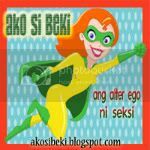 I know, the name is rather catchy, and would be more when translated to my native tongue, Filipino,"Ano kaya [kung]..." Hehe! Anyways, after my first ski-dventure, our group went for dinner at What If. 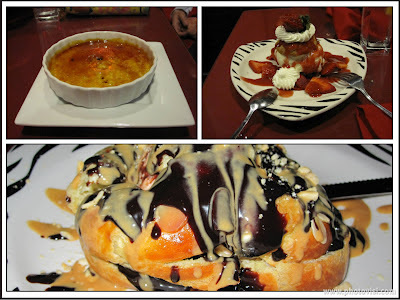 Vince and I have been to this restaurant several times already, and I will make a different post about our previous dining experiences there, but for now I will focus on the sweet treats we had after our exhausting ski-dventure. 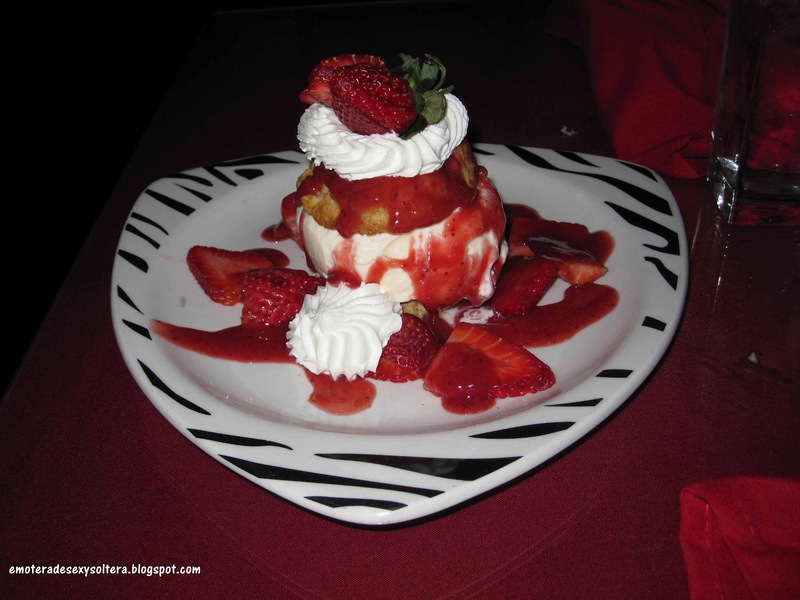 Vince and I shared an order of homemade oatmeal shortcake with vanilla ice cream, strawberries and whipped cream. I thought I wasn't going to like it because it looked too sugary to me, plus I'm not really a fan of strawberries, but I was totally wrong. 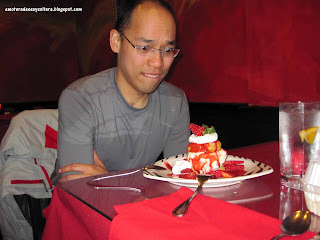 The cake and ice cream weren't too sweet and the strawberries were not too "sour" for my taste buds - it was just palate perfect. 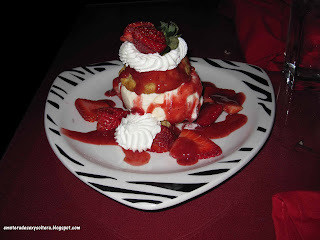 I really enjoyed this very attractive sweet thing, and mind you the colors did remind me of my wedding motif. Creme brulee is just about the same as leche flan. Now, I'm not too sure what the whole shebang was with Profitelol Du Jour. I was so engrossed with our oatmeal shortcake that I didn't even bother tasting the Profitelol Du Jour, but it looks like it had some kind of a bread or cake maybe, with chocolate syrup, powdered sugar, almonds, cream, peanut butter or caramel. Vince may appear in the picture like he was tempted and at the same time stumped as to how to finish that huge dessert in front of him, but don't worry, the dessert was successful in tempting Vince, so as Vince (with a little help from me) was successful in finishing it. Fair enough! 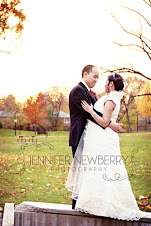 Last Sunday, my husband and I flew from Toronto Pearson International Airport going to Newark, New Jersey. When we checked in at our airline desk, the attendant gave me and my husband CBP Declaration Forms to fill up and explained that since we have different last names, we may need to each fill up a form. For the record, me and my husband are not newbie travelers, and we have flown from, to and through the States a lot of times already. We know for a fact that it's one CBP Declaration Form per family, but just to be on the safe side and especially that the airline attendant had pointed it out to us, we opted to each fill up two separate forms. I mean, what's the worst thing that could happen in the United States when two separate forms were filled up by a married couple with different last names like us, right? A waste of paper and ink maybe, but other than that I don't really see anything grievous to that err nor something that would cause a dire threat to the border or country whatsoever! Anyway, when we reached your counter, you asked both of us how we know each other. We said we're husband and wife, and then you retorted asking why we filled up two separate forms. I politely explained going back to what the attendant told us regarding me and my husband's different last names, but you sharply asked us, not just once but several times, in a sarcastic and condescending tone if we read the declaration form. And for the sake of all humanity, I spoke of the truth and nothing but the truth, that we did read the form not just that instance but all those other instances we've traveled and crossed the border by air! There was absolutely no need to read over to us that form again as if we were moronic nincompoops. I totally accept our failure to follow the instruction, but honestly, was it really necessary for you to reprimand us in such obvious sarcasm like we're uneducated people? You reminded me of this one other time that I flew from Pearson to New Jersey (didn't I tell you I've flown these route a lot of times already?). 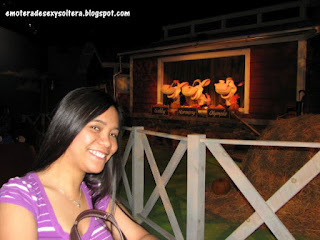 I haven't obtained my Canadian citizenship yet that time, so I was traveling on my Philippines passport. Your coworker, another smart alec US CBP officer, asked me what my citizenship is to which I replied, "Filipino." Guess what, I got corrected by this power-tripping-feeling-high-and-mighty officer saying that I'm not a Filipino but rather a FILIPINA. He gave me a heck of an argument saying that Philippines is similar to Hispanic countries in terms that there's niña and niño. Like, seriously??? That's the best he could come up with??? I was tempted to dare him go to the Philippines and ask any local female what her citizenship is, and then shoot me if he doesn't get the same answer I gave him, but after a quick thought, I realized that wasn't even why I was having a conversation with him in the first place! Does that even have anything to do with my potential as a traveler to cause trouble in your country??? Oh, for Pete's sake! Listen, we, as foreign travelers, totally understand that it's your job, duties, responsibilities and obligations as CBP officers to protect the border of the country you serve. We don't expect you to be Mr. Nice Guys and friendly-friendly "hi hello" to us, but a little pleasantry is always appreciated. As travelers, we deserve the same respect we give you as authority figures. We acknowledge that you are in a position to deny us entry to your country, so we are aware that we should do our best to cooperate with you. That's already a given and pretty obvious enough, so please, you don't have to rub it in with those unnecessary intimidating, power-tripping comments you consciously drop to foreign travelers. You just never know because it could happen that while you got busy picking on innocent, low-risk travelers like us (and yeah, ruining a supposedly nice trip), you'd end up missing the red flags on the traveler next in line. Karma could happen fast, you know. Come to think of it, wasn't it just a couple of years back that a traveler tried to blow up a Northwest Airline as it was preparing to land in Detroit? I'm sure you have a valid explanation how that one passed through the CBP! Therefore, going back to you, Mr. Customs and Border Protection Officer, I'm not generalizing here because in all fairness, I've had good CBP experiences too wherein the officers I've encountered with were pleasant and helpful, but you see, it would definitely make flying into the US nicer if there's more of those corteous officers and less like you. PS: I am now seriously considering to apply for a Nexus card.